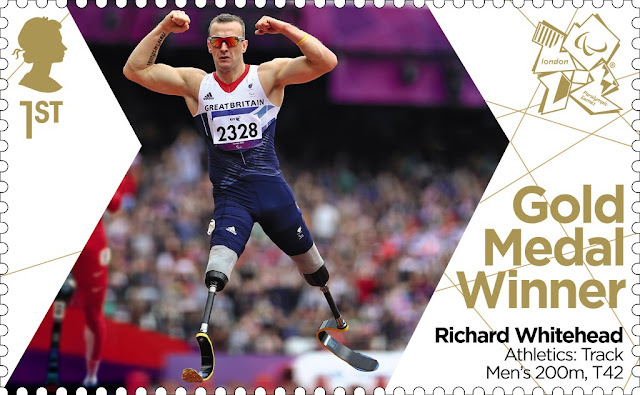 More Gold Medal stamps for Great Britain's Paralympians. 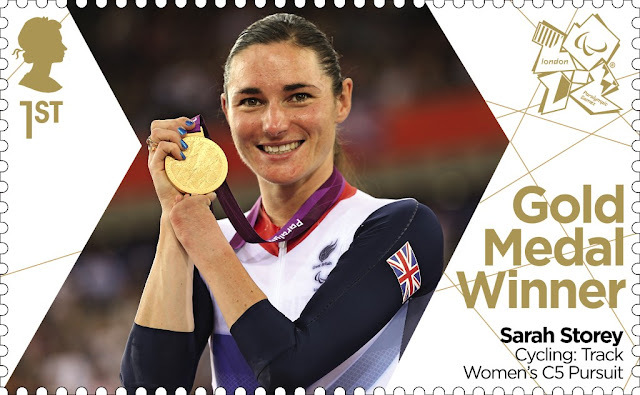 We can now say with more certainty how the Paralympics Gold Medal stamps have been and will be issued. 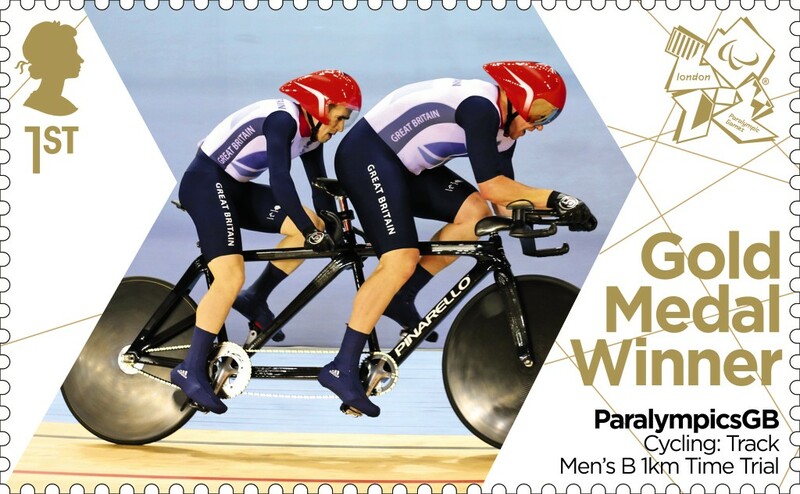 Stamp PGMW-A1 for cyclist Sarah Storey, winner of the women's C5 individual pursuit, was issued on Friday 31 August. There were 8 miniature sheets in the A4 sheet. Stamp PGMW-B1 for Jonathan Fox, who took gold in the men's S7 100m backstroke, was issued on Saturday 1 September, also in an A4 sheet of 8 miniature sheets. 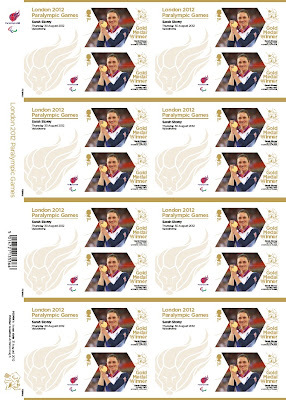 On Monday 3 September, four gold medal stamps will be issued in one A4 sheet (PGMWC). Stamp PGMW-C1 commemorates Mark Colbourne's win the cycling mens individual pursuit. 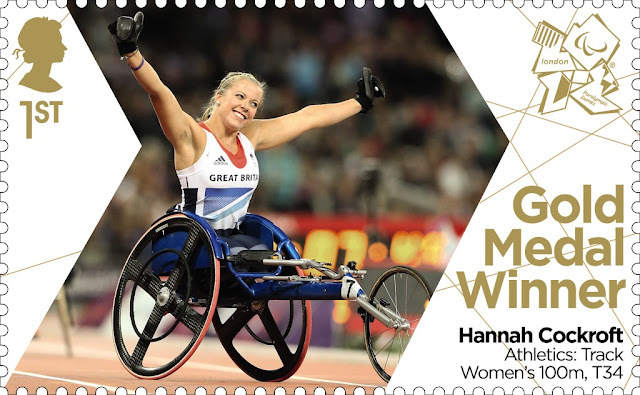 Stamp PGMW-C2 commemorates wheelchair racer Hannah Cockroft's paralympic record gold medal in the T34 100 metres at a packed Olympic Stadium. Stamp PGMW-C4 shows sprinter Richard Whitehead, who blasted through the field in the final 50m to win gold in the T42 200m. 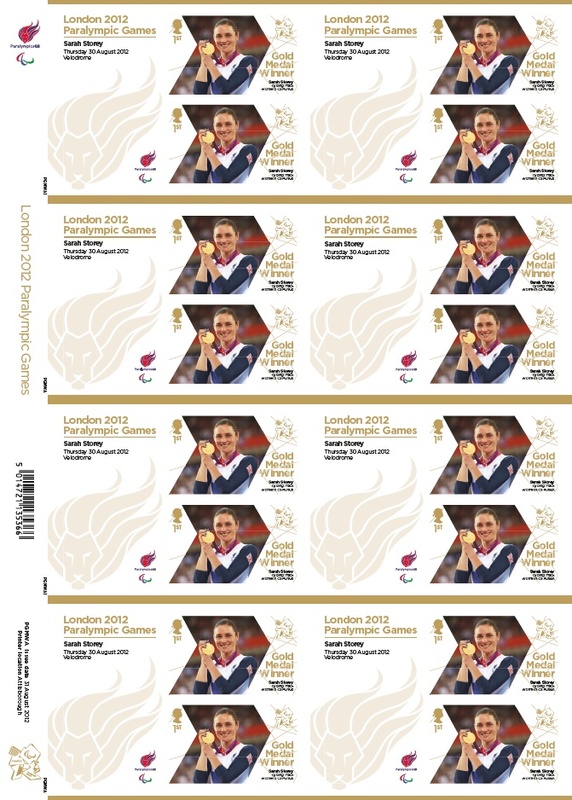 The second A4 sheet (PGMW-D) to be issued on Monday 3 September will contain miniature sheets for 3 medallists. Stamp PGMW-D1 shows Natasha Baker who won gold in the Paralympic Grade II individual equestrian event, riding Cabral on her Paralympic debut. Our first gold medallist Sarah Storey added a second London Paralympics track cycling title with gold in the C4-5 500m individual time trial, and will be featured on stamp PGMW-D2. 17-year-old Ellie Simmonds swam the race of her life to set a new world record and retain her S6 400m freestyle title. She set a new world best of five minutes 19.17 seconds to beat the old record by more than five seconds, and will appear on stamp PGMW-D3. This stamp will appear on the lower two rows of the A4 sheet. Well done Norvic for your speedy, efficient updates. 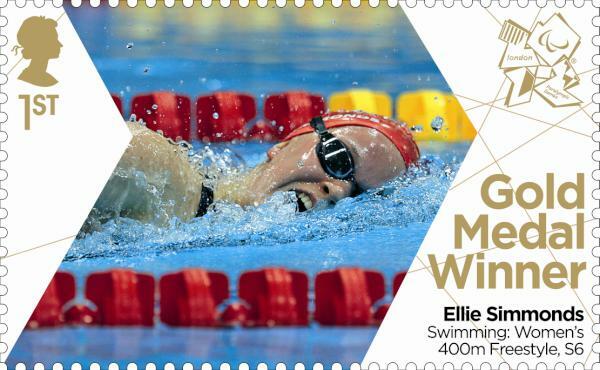 Ellie Simmonds is from Walsall, (Aldridge to be precise) not Norwich. We want the gold post box! Sorry about that, I could have sworn... well I did when I found I had another error to correct. Well done our team of readers, keep checking for typos!